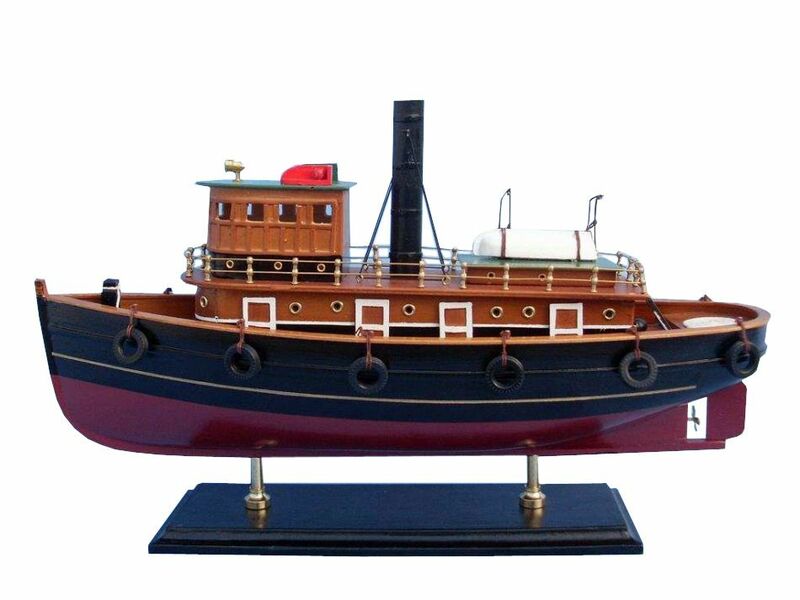 Rule the harbor and keep your fleet in order with this mighty yet adorable tugboat model. Paying homage to the hard-working boats that keep every great harbor operating, this model tugboat is a great gift for anyone who loves big machines, but also sets a perfect hard-working tone for an office or meeting room. A tugboat, or tug, is a boat used to maneuver, primarily by towing or pushing, other vessels (see shipping) in harbors, over the open sea or through rivers and canals. Tugboats are also used to tow barges, disabled ships, or other equipment like oil platforms. Tugboats are quite strong for their size. Early tugboats had steam engines (see steamboat); today diesel engines are used. Tugboat engines typically produce 500 to 2,500 kW (~ 680 to 3,400 hp), but larger boats (used in deep waters) can have power ratings up to 20,000 kW (~ 27,200 hp) and usually have an extreme power:tonnage-ratio (normal cargo and passenger ships have a P:T-ratio (in kW:GRT, of 0.35-1.20, whereas large tugs typically are 2.20-4.50 and small harbour-tugs 4.0-9.5). The engines are often the same as those used in railroad locomotives, but typically drive the propeller mechanically instead of converting the engine output to power electric motors, as is common for railroad engines. For safety, tugboats' engines often feature two of each critical part for redundancy. A tugboat's power is typically stated by its engine's horsepower and its overall Bollard pull. Tugboats are highly maneuverable, and various propulsion systems have been developed to increase maneuverability and increase safety. The earliest tugs were fitted with paddle wheels, but these were soon replaced by propeller-driven tugs. Kort nozzles have been added to increase thrust per kW/hp. This was followed by the nozzle-rudder, which omitted the need for a conventional rudder. The cycloidal propeller was developed prior to World War II but was only occasionally used in tugs because of its maneuverability. After World War II it was also linked to safety due to the development of the Voith Water Tractor, a tugboat configuration which could not be pulled over by its tow. In the late 1950s, the Z-drive or (azimuth thruster) was developed. 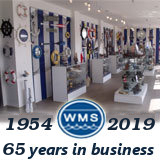 Although sometimes referred to as the Schottel system, many brands exist: Schottel, Z-Peller, Duckpeller, Thrustmaster, Ulstein, Wärtsilä, etc. The propulsion systems are used on tugboats designed for tasks such as ship docking and marine construction. Conventional propeller/rudder configurations are more efficient for port-to-port towing. The Kort nozzle is a sturdy cylindrical structure around a special propeller having minimum clearance between the propeller blades and the inner wall of the Kort nozzle. The thrust:power ratio is enhanced because the water approaches the propeller in a linear configuration and exits the nozzle the same way. The Kort nozzle is named after its inventor, but many brands exist. A new type of tugboat has been invented in the Netherlands. The so-called carousel tug consists of a design wherein the flexibility and effectiveness of the tugboat's maneuvers is determined not by the propulsion system, but by a steel construction on deck, consisting of two steel rings. The inner ring is fixed to the ship, and the second ring rotates freely and carries a hook or winch. The ship can therefore maneuver freely and independently of the towed ship, and since the towing point rotates towards the point nearest to the towed ship, the tug can capsize only with difficulty. One prototype exists presently, but the first new tugs are expected to sail in spring 2007.